Both developing and applying advanced LCD-related technologies, Winmate provides the optimized products portfolio satisfy all of your requirement. Base on display and embedded system core technologies, Winmate deliveries value-added modulized-technology solutions for our customers. 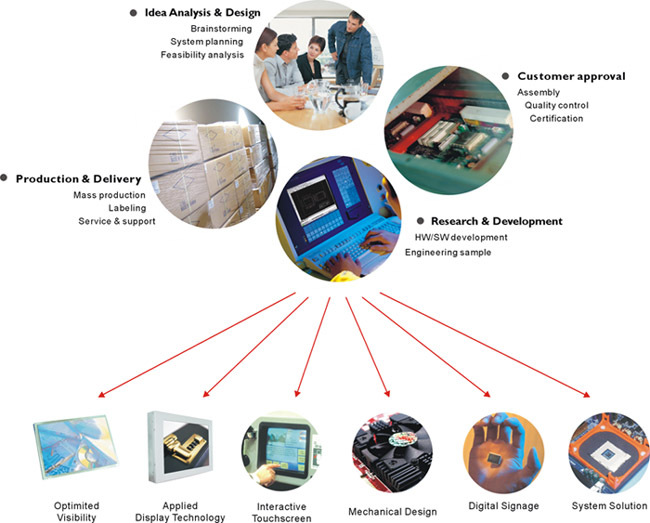 With a customized process varying from customer to customer, from idea design, hardware& software development, customer approval, mass production to delivery. It is a dedicated know-how for every environment to design, develop and manufacture high-quality and reliable products. Winmate is focusing on product stability and would like to be a leader among competitors. With the historically grown engineering capabilities, Winmate has become one of the leading companies in Taiwan for Engineering, Product Design and Manufacturing all in one Building. As a well experienced manufacturer of industrial display, Winmate has focused on customized production since many years. The different requirements for the production ofGolden Samples, small quantities with changing demands and continuous mass production is well established and can fulfill our various demands from the Market.